For most NFL players, their careers are over by the age of 35. For running backs, the career span is even shorter, with most out of the league by the time they are 30. Many are left wondering what to do next. Ricky Williams, former Heisman Trophy winner and star running back who played for the New Orleans Saints, Miami Dolphins, and Baltimore Ravens always knew there was something else beyond football for him. After retiring in 2012, he began traveling and discovered he loved herbs and wanted to help people feel better. He studied Ayurveda in 2004, when he first retired from the NFL, to learn more about herbs. That learning experience expanded to other healing modalities. He’s currently going to school to earn a degree in Chinese medicine. Just last month, Williams founded a new line of cannabis-based products called “Real Wellness by Ricky Williams (RW),” a cannabis-based well- ness brand. All of the products are derived from Williams’ own formulations that can be incorporated into daily health routines. 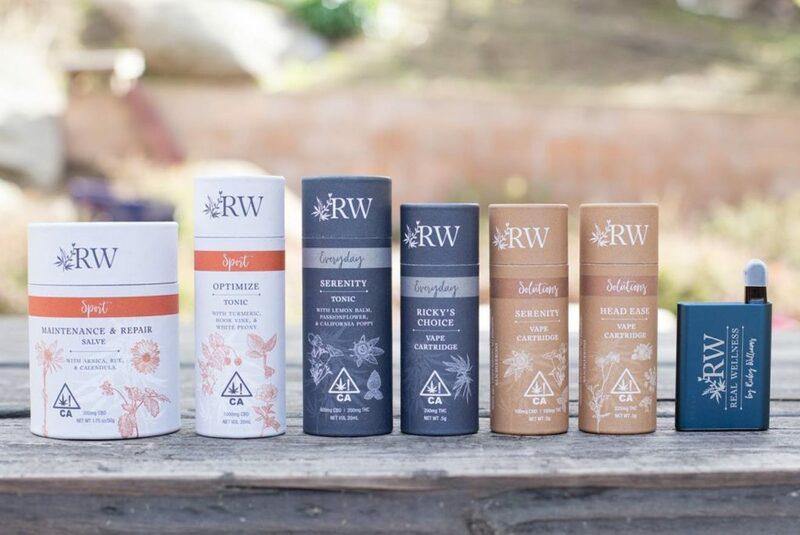 RW’s initial product assortment contains six products that include either hemp- derived cannabidiol (CBD), tetrahydro- cannabinol (THC) or a mix of both. Through carefully chosen delivery methods of salves, tonics and vape car- tridges, all six products allow consumers to harness the positive effects of cannabis in a more conscious and controlled way. Additionally, the formulations draw on the wisdom of multiple herbal pharma- copoeias by incorporating various herbal extracts like arnica, lavender and turmeric to support certain condi-tions. Cannabis played an integral role in Williams’ own healing journey, and he felt a responsibility to share what he learned in the process. His first exposure to the busi- ness side of the industry came after a friend asked him to speak at a cannabis conference in Phoenix, AZ in 2015. Williams felt that he found his voice in the cannabis space. People were willing to listen to what he had to say. There were two reasons why his brand is called Real Wellness by Ricky Williams, he notes. In addition to the six products his com- pany is now selling, Williams says that they are working on new ideas and con-cepts. They have ideas for herbs that can help with attention and focus and im- prove memory as well as a healing salve for skin inflammations. For more information, visit www.rw.life. I would like to be involved with your brand. My private capital firm can arrange adequate business funding to help take your company to the next level. Please contact me, I’m interested in your brand. I would also like to be involved in your RW brand. Please contact me at JoePrice100@gmail or Joe Price, c/o Coldwell Banker Commercial Real Estate, 901 East Las Olas Boulevard, Fort Lauderdale, FL 33301.